Scientists with USDA's Agricultural Research Service (ARS) maintain the U.S. National Fungus Collections, North America's largest collection of fungi. The collection is curated by ARS biologist Shannon Dominick. ARS is USDA's chief intramural scientific research agency, and this research supports the USDA priority of promoting international food security. According to Amy Rossman, research leader of the ARS Systematic Mycology and Microbiology Laboratory (SMML) in Beltsville, Md., the collection started with fewer than 3,000 specimens in 1885 and has grown to more than 1 million reference specimens. ARS molecular biologist JoAnne Crouch of SMML identified the fungal culprit of anthracnose disease in centipedegrass in the southern United States. While many in the industry suspected a fungus called Colletotrichum sublineola, Crouch found that a different but related fungal species, C. eremochloae, was the cause. 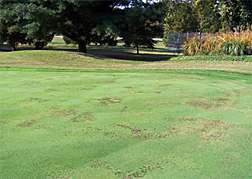 Finding the correct suspect allows turf grass managers to use the proper fungicide to control the disease. Another fungus has caused problems for two tropical plants that produce edible fruits—rambutan and pulasan—in Honduras. A little known fungus, Dolabra nepheliae, was discovered to cause a stem canker disease known as "corky bark" of these tropical plants. Rossman and her colleagues in SMML and in Honduras identified the fungus using both microscopic structures and molecular sequence data. The research will help plant pathologists to accurately identify the cause of this disease in specialty crops. It will also help plant quarantine officials to identify disease-causing fungi.